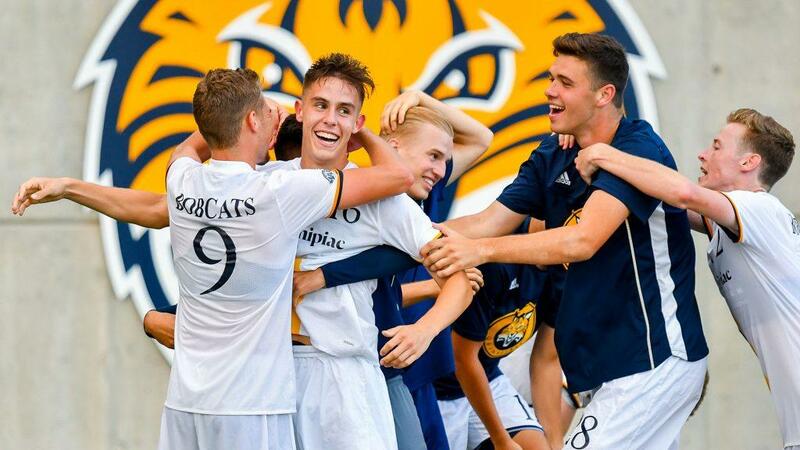 An overtime goal scored by Oriac Vila Rotxes propelled the Quinnipiac Bobcats (1-4-1, 0-0 MAAC)) to a thrilling 2-1 victory over the Albany Great Danes (3-4-0, 0-0 AEC) on Saturday afternoon. “We know what he’s capable of,” said Bobcats head coach Eric Da Costa after the game. “Oriac is a really good player, and he’s making the adjustment.” Vila Rotxes had only played seven minutes all year before being subbed in to start overtime, when he scored his goal with under a minute remaining. Paulo Soares made an aggressive run into Albany’s final third where he was fouled by Riccardo Iafrate just outside the penalty box, for which Iafrate was awarded a yellow card. Soares made the most of the opportunity, as a beautiful free kick into a crowd of players found the head of Vila Rotxes for the win. The Bobcats clawed their way into the win column for the first time this season, but it did not come easily. Albany looked to be the superior team throughout most of the game, but made one too many mistakes to come away with the win. The Great Danes dominated most of the first half, but they were never able to cash in on their numerous chances. Whether it was an early breakaway about a minute in, Carlos Clark missing a finisher from a cross inside the box, or Nico Solabarrieta’s inability to convert on one of his many scoring chances, the first half was not kind to Albany. Quinnipiac showed signs of life late in the first half after being stifled through most of the opening 45 minutes, coincidentally after they subbed out their leading scorer, Eamon Whelan. After getting some offensive pressure, the Bobcats drew first blood with little time left in the half to do so. After Soares took a crafty touch to get free and made an equally impressive pass to captain Matthew Taylor, Taylor fired a gorgeous cross in the box to Romain Daniellou, who put a header past Albany’s Danny Vitiello with 53 seconds before the break. It seemed as though Quinnipiac had taken Albany’s best punch in the first half before they eventually broke them down to take the lead. However, as the opening minutes of the second half showed, the Great Danes had plenty left in the tank. After Whalen missed a great opportunity to bring Quinnipiac’s lead to two goals, Albany kicked it into gear, as they applied very heavy pressure on both ends of the ball – even more than in the first half. Eventually, all their hard work led to a goal, as Reid Conde delivered a perfect cross into the box for Solabarrieta, who pushed it past Jared Mazzola for his third goal of the season. Da Costa was not pleased with his team’s defensive execution on the score. After the goal, both teams went back and forth throughout the rest of regulation, before Albany missed a few good chances before the clock hit zero. Overtime looked a lot like the first half with Albany getting pressure and momentum for the first few of a ten-minute extra period. The Great Danes almost ended up winning when Solabarrieta tried a bicycle kick in the box off of a great delivery on a long throw in, and Mazzola himself admitted he “couldn’t see the ball”, but it was spiked into the turf harmlessly into the goalkeeper’s hands. Afterwards, Quinnipiac finally woke up and got some pressure offensively, leading to Vila Rotxes’ heroics. Next up for the Bobcats is a matchup against Lafayette on Tuesday. As for Albany, they get a chance to rebound in a home tilt on Friday against Stony Brook.